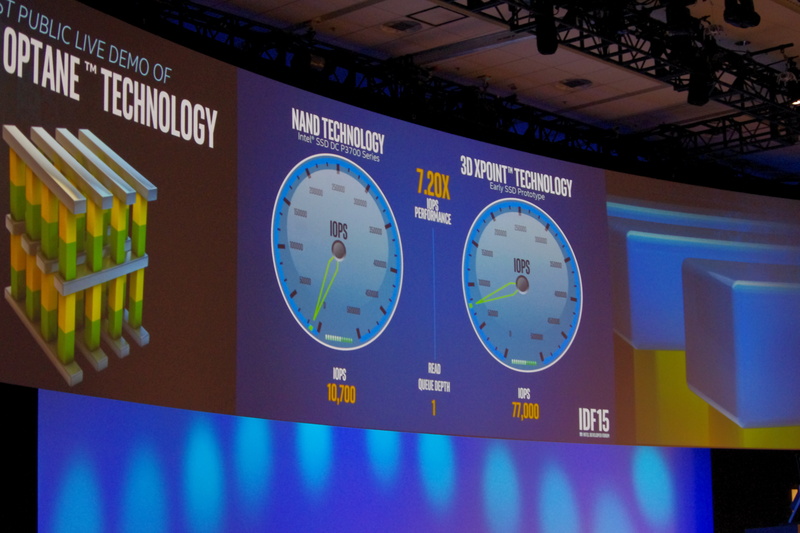 Last month, we heard about a brand new memory standard from Intel and Micron; namely 3D Xpoint. Just a few minutes ago, Intel unveiled a new brand with the name of “Intel Optane Technology” – which will be the official name of its products involving 3D XPoint tech (pronounced Cross Point). The specifications advancement made are very impressive and are certainly many times faster than conventional SSDs. While sampling will begin later this year, they will hit the shelves sometime in 2016. Now here is the interesting thing. Optane based memory devices arent just for storage, they will be available in the DIMM format as well. Infact, they will be available for everything from Datacentres to Ultrabooks and while the mainstream niche will most probably be interested in them as a storage memory standard, their versatility enables them to be used in the DIMM format as well for Xeons. The Optane SSD that was demoed at Intel Developer Forum 2015, today, was a PCIe based device that was pit against the Intel P3700 SSD (which is the best offering in conventional SSD storage Intel has right now). The Optane SSD was able to achieve 7.2x times more IOPS at low queue depth and upto 5.21 times the IOPs of conventional SSDs at high queue depths. An Optane Technology based SSD has 10x times the density of conventional SSD drives. The marketing material also claims it is 1000x faster than the competition available on the market but it isn’t clear to what exactly they are referring to – a good guess would be latency, as opposed to bandwidth. Optane SSDs will have 1000x the endurance – which, if true, should mean the device has virtually unlimited life span for practical purposes. Intel has been very tight lipped about its new standard and we know very little apart from the skimpy demo. What we do know comes from old press releases. 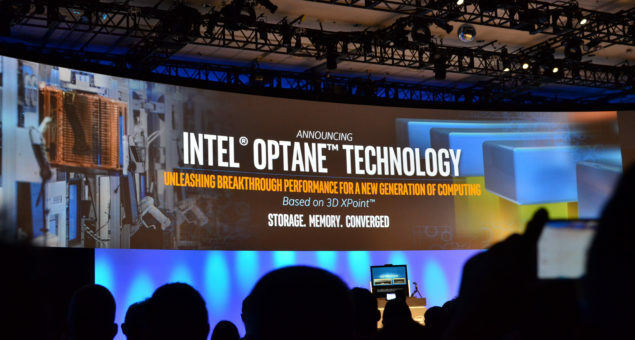 Basically 3D Xpoint technology (pronounced Cross Point) – the heart of the Optane platform is one of the new types of non-volatile memories that have risen lately. Unlike ReRAM – which is supposed to be a replacement technology, Optane based solutions are targeted as intermediaries, neither here nor there. Another thing to note is that unlike SSDs, the cross point structure has much higher endurance – which means more life span and a much higher total write limit. All Optane based devices will feature a cross point array structure, which consists of perpendicular connectors connecting around 128 Billion memory cells (16 Gigabytes per chip). This “3D” method is the reason why Optane based devices have 10x times the density of conventional solutions. Like DRAM, Optane memory is stackable in nature. One of the biggest changes in this technology however is that it eliminates the need for transistors – accessing the memory cells by varying the voltage sent to the particular sector. Basically, using the bulk of the material itself. The platform is naturally very disruptive in nature. If priced right, this could spell the death of SSDs as we know it – although costs wont come down till the next few years before economies of scale kicks in. This year’s IDF has been one hell of a show and has seen Intel stepping out of its comfort zone and becoming something more than simply “a company which makes processors for personal computers”. The Internet of Things and Wearable had been highlighted, but this is definitely one of the more important updates from Intel. A brand new memory standard and a new brand from Intel under which to sell the tech under.